The 17th century farm of Agriturismo Palazzo Bandino is a family vineyard for 6 generations, passing down the love of the wine, olive oil, horses and of Tuscany throughout the years. This restored convent and farm is comprised of 4 B&B style bedrooms and 9 self catering apartments. Located near the thermal waters of Chianciano Terme, these vacation rentals boast not only enchanting landscapes and comfortable accommodations but also a full fledged spa with a hot tub, sauna and so much more, a delicious restaurant featuring fresh local products on the menu and an on-site stable for guests with a passion for equestrian travel. The convenient position offers the traveller the opportunity to adventure into the fabulous landscape of Val d’Orcia and Val di Chiana on bike, or trekking the trails and by horseback. 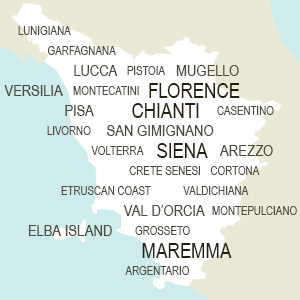 Close to major roads, it is also easy to plan day trips to Siena, Florence and Arezzo. The family farm from the 1600’s has been completely restored to its original splendor and now accommodates 4 B&B style-bedrooms with en-suite bathrooms and 9 self catering apartments with one and two bedrooms. The spacious estate has 10 hectares dedicated to producing DOCG wines from the area and quality extra virgin olive oil. The owner is passionate about the land, his wine and his horses and he invites you to come with your friends and family to experience the incredible beauty of south Tuscany at his farm Agriturismo Palazzo Bandino. The eco-friendly agriturismo farm, has a self serving energy system that recycles the trimmings from the vineyards and olive groves to heat the water and spa covering about 80% of their needs. Their attention to Mother Earth also includes an organic garden where you will find many of the main ingredients on the menu at the on-site restaurant. You are invited to start your day at their rich buffet breakfast, or participate in the cooking classes where the family shares some of their favorite recipes and secrets in the kitchen. Or you could just show up for dinner and savor the family Chianti wines or extra virgin olive oil. There are three double bedrooms located on the first floor of the Agriturismo Palazzo Bandino farmhouse. Each room boasts a private entrance, WiFi, is own AC unit and an ensuite bathroom with shower. In the main house, you will also find four apartments with one double bedroom and a fully equipped kitchen, furnished for making your own meals while on holiday. The traditional yet elegant decor highlights the natural beauty of the rooms and apartments. This structure also houses a two bedroom apartment on the first floor, and the private bathroom comes with a shower. In the neighboring building there is the fourth bed and breakfast double room, and four more apartments suitable for 2 - 4 persons. All apartments have AC, WiFi and a safe for valuable documents or personal belongings. The family invites you to explore Tuscany, but they also make staying at Agriturismo Palazzo Bandino just as enjoyable! All guests can reserve their entrance to the on site spa called “Sensi Divini”, certainly a play on words (di-vini, could also mean of wine) because some of their more popular experiences include treatments with products based on the local products: wine and olive oil! Make use of the sauna, an appointment for a massage or the heated outdoor tub overlooking the wonderful landscape in the province of Siena- great for spring and fall relax. We are in the land of the Etruscans and the unparalleled charm of the area includes traditions, landscapes and stories that will accompany you everywhere while on your holiday at Agriturismo Palazzo Bandino. And the family invites you to enjoy it all on horseback. Ask about travelling with your own mount or what adventures they have planned while you are vacationing here. There are 1 - 2 and 3 hour tours of the area which will introduce you to the land and culture, at a slow yet comfortable pace. For those who prefer the adventure to be at the table, then you will find that Agriturismo Palazzo Bandino has a program for you. The cooking class draws from the rich culinary traditions of the area and highlights classical recipes with pure and natural ingredients...just like “nonna” (grandmom) would have made. The class includes an appetizer, two main dishes and a dessert - of course it is all accompanied by excellent wine and olive oil, direct from their cantina. Take an opportunity to visit the family vineyards and wine cellar and talk listen to how they transform Sangiovese grapes into world famous wines. If traveling and exploring the land is where you want to be, then you will find that Agriturismo Palazzo Bandino is ideal situated to show off some of the most beautiful areas of Tuscany: the world famous rolling hills of Val d’Orcia and the vineyards and olive groves of Val di Chiana. Small picturesque towns like Chiusi, Montepulciano and Cortona are easily reached in an afternoon. With just a little more travel, through the panoramic landscape, you will find places like Arezzo, Siena and Florence - filled with important museums, monuments and delicious restaurants. The farm, vineyard, olive groves and the antique home are all ready to greet you and help you to discover the flavors and adventures of southern Tuscany. From "Nonno" Beppe to the "Mamma" Mirella to the daughter Marta; those who are still with us today and the ghosts of generations who have gone before - you will find that everyone has a story to tell.